Agra day tour by train is good for them who can not travel long by car and interested to travel in train. So this way they can enjoy the Indian train too. This tour start from Delhi at 6 AM, Shatabadi fast train take 2 hour to Agra, We pick up you from your hotel or staying place, and drop to Delhi railways station from there you travel to Agra by train, After arriving the Agra our driver and guide meet you at railways station, then drive to Tajmahal, at first this is the same monument which attract to tourist at most symbol of love. Rest of history you will know from our knowledgeable guide. After that they will take you to red fort, the amalgamation of mughal and Persian art, here guide will get you introduced with the lavish life style of mughal emperors. After visiting the fort, take a short break and enjoy the malty cuisine lunch in well maintained restaurant. 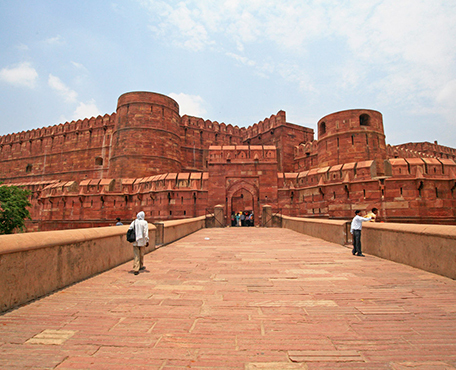 From now they will drive you to desert city fatehpur sikri, 37 KM, from main city, in the old time it was the capital of mughal. This monument is very spacious and gorgeous. After the fatehpur sikri, still we have the time during this gape of time to train, we show you one more beautiful live show which is based on Indian culture and tradition, here you will see the stage show where the artist act like Shahajahan, Mumtam and other emperors. This show is really wonderful which you will not find in whole over the world. When this show is over driver will drop you to Agra cantt railways station from there you board on the train to Delhi, after arriving Delhi our driver will meet you at the railways station who will pick up you from there and drop to your hotel / home stay etc.